Book an economic private taxi or bus from Malaga airport to Nerja with our transfer services filling in the form on the top. Distance to the airport: 51 km. Nerja is a dream land that has a special charm, completely different from what you may find in other towns of the Costa del Sol. 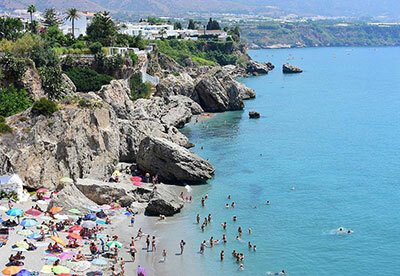 Its beaches and coves easily qualify as the best of Malaga and the atmosphere lived in the village of Nerja, and the close by places of Maro and Frigiliana is enviable; not surprisingly, many foreign tourists decide to buy a home in this coastal area. The tourist offer is completed with a visit to the startling and thrilling Nerja caves, filled with traces of the past and human origins; visualizing the Aguila Aqueduct; visiting the Museum of Nerja near Plaza de España; continuing south and making another stop in the square where is situated the beautiful church of San Salvador, an area full of good restaurants and gift shops and ending on the lookout “Balcony of Europe” (El Balcon de Europa), an emblematic place of the municipality and which you definitely should not miss because this balcony is one of the best places of Malaga. 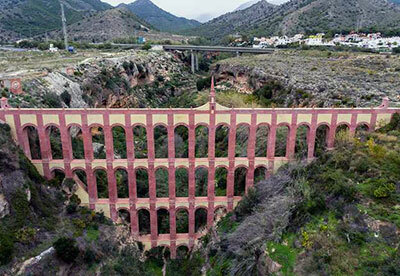 Our private taxi services offer the best and most professional alternative to public transportation to get to Nerja; also our Malaga tours are a great way to discover the mysterious caverns. 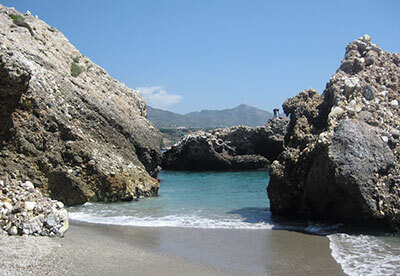 The Nerja Caves are located just over three kilometres from the town, just north of the village of Maro. 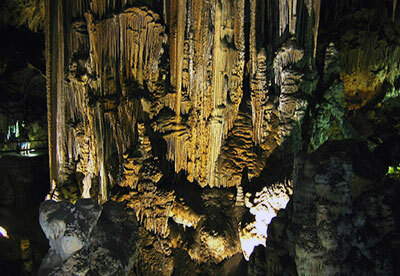 The caves of up to 35,500 m2 were discovered over 50 years ago, in 1959. The caves are divided into three galleries and these into different chambers. To the general public is open only one, the touristic gallery. The other two would be accessible for expert cavers or exceptionally and with booking in advance, anyone with good physical condition can get access to these two galleries enjoying a unique adventure. With the passage of time the galleries have been explored and through this work have been discovered fossil remains of great value, and seal paintings dating back more than 42,000 years, an impressive finding. Economytransfer offers a means of transport completely personalized for your holidays in the Costa del Sol thanks to Malaga airport taxis. The municipality also is internationally recognized for the charismatic TV series Verano Azul produced in the early 80s and like tribute you can see a replica of the Chanquete Boat (The Dorada I) in a roundabout next to Verano Azul park. along with the streetview Balcon de Europa, and becomes spectacular beaches. it is positioned in an isolated area with a beautiful and fascinating natural environment. as: Carabeo, El Salon, the Alberquillas, de Torrecilla, etc. 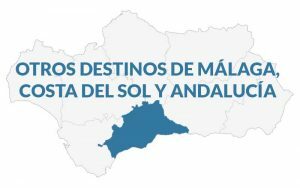 You even have the possibility of venturing to enjoy the beaches of Almuñecar and the Herradura, both in Granada which is very close to Nerja.